The Drowsy Chaperone began as a spoof on classic musicals of the 1920s, written by three friends for presentation at the bachelor party of another friend. Since its creation in 1997, it went on to premiere on Broadway and won several Tony awards. This season, The Drowsy Chaperone opens at McGill’s Moyse Hall, produced by the university’s Arts Undergraduate Theatre Society (AUTS). The musical, which consists of a play-within-a-play structure centres on Woman-in-Chair, a woman who, in an attempt to drive the blues away, decides to play the recording of her favourite musical, The Drowsy Chaperone. In doing so, the musical, set in the 1920’s, comes to life in her living room, where she guides the audience through the cast of stereotyped over-acted characters, calamitous spit-takes and campy plot developments. The action focuses around the bride-to-be, Janet Van der Graaf, and her soon-to-be husband Robert Martin. Janet’s former vaudeville producer employs two gangsters to try and break the pair up, who in turn enlist the help of the irresistible ladies man, Adolpho, to seduce the bride. Add Janet’s alcoholic confidant, The Drowsy Chaperone, to the mix and a series of comic misunderstandings threaten to leave the upcoming nuptials at a standstill. The show, written by Bob Martin and Don McKellar with music and lyrics by Lisa Lambert and Greg Morrison, highlights the outdated style of old-school musical theatre while simultaneously paying homage to it. Director Fiona Ross, a recent McGill graduate, was doing research on possible shows when she stumbled upon this one. “It’s Canadian, there’s lots of strong women characters in it which is something that’s really important to me, and it ended up that we had a whole bunch of really talented women audition, so I was like, ‘let’s just cast all these women’,” she said. While some of the cross-casting proves humorous and charming, such as with the earnest bridegroom, Robert, played by Natalie Aspinall, and Chelsea Wellman as the seductive Adolpho, some roles were not so well suited. Overall the abundance of female actors prancing around in tight-fitting tweed suits was a bit aesthetically jarring. Vanessa Hutinec, who played the title character of the Drowsy Chaperone, was excellent, and performed her number “As We Stumble Along” beautifully. She and several other members of the supporting cast managed to do quite a bit with the limited stage-time and dialogue they were given in the script. Not all the female leads attained the same level of quality however, with some of the most important characters falling short in their performances. Sadly, as with many amateur productions, the show was plagued by microphone and sound problems, which found actors either drowned out by the live band or overly loud during scenes. The Drowsy Chaperone is a difficult show in that it relies upon an execution of subtle comedy and critique, while speaking directly to theatre-lovers about their most-beloved topic — theatre itself. The AUTS production is a great assembly of young talented voices and actors, but ultimately lacks a directorial oversight that would pull the whole thing together. Despite the show’s shortcomings, this simple statement captures a truth about people who love theatre, and why they keep coming back, and that in itself is something worth waiting around for. 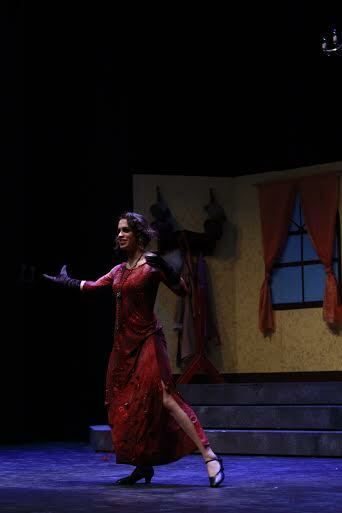 The Drowsy Chaperone runs at the Moyse Hall until Feb.1. Student tickets are $15.